UniTel Voice is your simple and affordable business phone system solution. UniTel Voice is a hosted PBX solution you can use to turn your remote employees into a professional call center to manage sales and customer support calls. It only takes minutes to set up and it couldn’t be more affordable. In fact, UniTel Voice is priced to grow with your business so it works for entrepreneurs on any budget. Here’s how a typical small business owner would use UniTel Voice’s hosted PBX phone system: First, you would choose a primary 1-800 phone number for your business. Next, you would set up a main greeting (virtual auto attendant) that would greet your callers and route them to the proper department or employee extension. And finally, you would set up your call forwarding so calls are forwarded to the right extension, phone, or voicemail. Everything is managed online and UniTel Voice’s hosted PBX solution works with your existing phones (home, office, cell, landline, VoIP, or smartphone app). No expensive virtualPBX equipment. No complicated ACD-auto attendant setup. Just free USA-based support and unlimited extensions for less than $10 per month. 1. UniTel Voice is designed to give mom & pops superpowers. UniTel Voice is a virtual office phone system with the same hosted PBX technology that huge companies use to run their business phones. It’s backed up by a world-class network and technical infrastructure that will give you the peace of mind that you’ll never miss a call. The big difference is, UniTel Voice is designed for startups, home-based businesses, solo entrepreneurs, and small mom-and-pop shops. Our hosted PBX solution is low cost and easy-to-use, it allows you to intuitively set up an auto attendant and call forwarding phone tree even if you’ve never managed a phone system before. It also includes a virtually unlimited number of department and employee extensions and voicemail boxes so you can customize it to your needs. With UniTel Voice, you can run your business using cell phones and sound like you are a Fortune 500 company. 2. UniTel Voice offers a low-cost, high-quality solution. With UniTel Voice, for around ten bucks a month, and zero technical skills, anyone, on any budget, can set up a professional small business phone system (with all the features of a robust hosted PBX ) in just minutes. There’s no equipment to set up because it works with your existing phones (cell phones, flip-phones, smartphones, Comcast Xfinity VoIP phones, Vonage phones, MagicJack, Google Voice, Skype and even traditional landlines). This is a gamechanger for small businesses owners who don’t have the time, money, or technical expertise to give their business a proper phone solution that keeps them connected and sounding professional. 3. We love our customers – a lot. 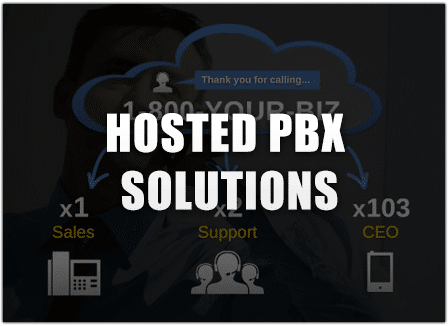 When it comes to hosted PBX solutions the number one feature small business owners want/need is good customer support. At UniTel Voice, we love each and every one of our customers. Every customer, big or small, gets the opportunity for one-on-one help from our 100% USA-based account management team on setting up their business phone system. We’ll literally set things up for you if want us to, and that includes a professional voice recording for your auto attendant’s main greeting, no extra charge. We want to save you money, time, and stress. Your happiness is our number one goal.